You can safely subsist on kitchari for days anytime you need to reset your digestion, eliminate toxins and restore vibrancy. Photo credit: Kate Towell. It’s cleansing season and for me that means it’s time for kitchari. I started my cleanse yesterday, and I am so happy my husband is joining the adventure this time around. Ayurveda cleansing differs from many other forms of cleansing for a number of reasons, but the most important difference (I think) is that you get to eat. And kitchari will be a big part my diet for the next several days. In my experience with cleansers most people love kitchari but some folks really don’t like it. Either way, you can’t argue with the super power effects of this simple healing dish. 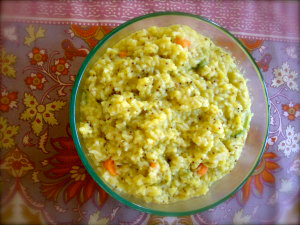 In India, kitchari—also sometimes spelled kitchadi—is a hearty porridge made from rice and mung beans that is loaded with yummy Indian spices. It is considered a cleansing food and is used to purify digestion and nourish and heal the body. Ayurveda believes all disease (and therefore all healing) begins in the gut. The concept is simple. When you give your body a single, completely nourishing food that is easy to digest your body has energy to eliminate toxins and heal. When should you eat Kitchari? You can safely subsist on kitchari for days anytime you need to reset your digestion, eliminate toxins and restore vibrancy. Try it for one or more days and report back how you feel. Banyan Botanicals makes an awesome kitchari kit check it out and watch their video on how to make kitchari.